For the first time in the 226-year history of the Wall Street market, a woman has been appointed as the sole chairwoman of the board that manages the largest capital market on the planet. 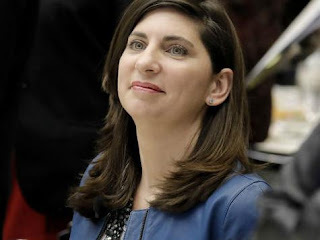 Stacey Cunningham, current director of operations of the New York Stock Exchange, will be in charge of the Big Board next Friday in relief of Tom Farley. With her promotion, two of the three largest stock exchanges in the United States will be led by women and both will have the mission of preserving their relevance to the new electronic virtual platforms. Adena Friedman assumed the position of CEO of the Nasdaq electronic market in January of last year. Stacey Cunningham takes the NYSE presidency at only 43 years of age. She began to climb positions in the society that manages it in 1994, when she started doing internships. From there to breaking the glass ceiling in two decades. Recently, she gave a speech in which she told that his great inspiration was Muriel Siebert, the first woman who worked in the New York Floor in 1967. The NYSE dedicates a space to her in its headquarters. Farley's relief was anticipated last night by The Wall Street Journal and confirmed this morning by a spokesman. The newspaper "Wall Street Journal" reported that Farley will work as a financial investor to lead a special fund for acquisitions that wants to raise $ 400 million for purchases in the field of financial technology. Cunningham, a graduate in industrial engineering from Lehigh University in Pennsylvania, took charge of NYSE operations three years ago, in June 2015. She was in charge of ensuring that the New York park plumbings work perfectly. She was also responsible for engaging in direct discussions with regulators to protect the interests of investors. The irruption of computing in stock market transactions forced her to pay special attention to the relationship with stockbrokers, so that they work in harmony. She is perfectly aware of the importance of her promotion. Technically, she is not the first woman to hold the same position on the NYSE. Catherine Kinney already made history on Wall Street when she co-chaired the Big Board between 2002 and 2008, but then the management of the most liquid trading floor in the world fell to the CEO. That changed when the New York Park was taken over by the Intercontinental Exchange. The NYSE has 800 employees and manages a volume close to 1,500 million shares daily, a fifth of the market. "Cunningham carried out an adequate management of our products, distinguishing as a leader focused on the client and respected by the industry", assured the president and CEO of Intercontinental Exchange, Jeff Sprecher. "More than half a century after Muriel Siebert became the first woman to have a seat on the New York Stock Exchange, Stacey represents a new generation of leadership for the group, and I am sure she will continue to promote this vital institution, ensuring that it remains the center of the global capital markets," added Sprecher. Just one month ago, it was announced that the bronze statue of the girl without fear will be installed before its headquarters in the financial district. Farley applauded the decision to place the work of the artist Kristen Visbal before her porch, because she considered it an "impressive symbol of the march towards gender equality" in the executive positions. Cunningham worked on Wall Street as a specialist for JJC - which became a subsidiary of Bank of America - from 1996 to 2005. That was before joining the Nasdaq tech index, according to his LinkedIn profile. She rejoined the NYSE in 2012 and became the second most important person three years later. Despite this gigantic step it is still a world dominated by men. Among the 21 executives that make up ICE, only four are women, including Cunningham herself. Its great challenge will be to preserve the relevance of large stock exchanges against the evasion of electronic platforms.